My Tomtom GPS Speaks Esperanto! Well, it was a bit of a struggle, but I finally got my sound files recorded, converted, and compressed and put on my Tomtom GPS. The first struggle was translating the 59 voice clips of the words and phrases used by the device. It puts them together in meaningful ways to tell the user where to turn right or left, turn around, make a U-Turn and when you’ve reached your destination. Seems I created some discussion over what to call a turn and how one refers to a U-Turn in Esperanto. Then I recorded the commands using Audacity. With that I saved the files as .OGG. 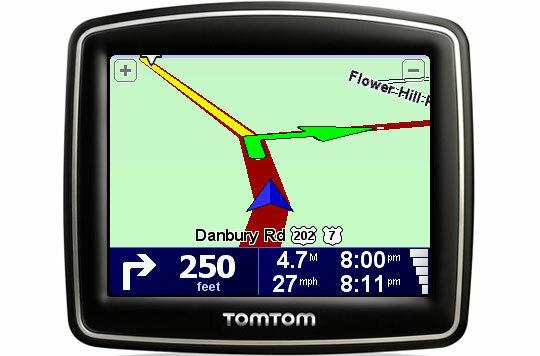 Then I had to download viftool, which is a little program used to compile all of my sound files into one data file compatible with the Tomtom. This gave me some trouble as first I unzipped viftool file by file. I was supposed to simply unzip the folder it was in. Then I had the problem of learning how to use the command line prompt on my PC to run the program. What a learning curve! The best instructions I found for this whole process are here. So, if you have a Tomtom GPS and speak Esperanto or just want your GPS to give you directions in it, go to you Tomtom Home, go to add voices, and search for Esperanto. The voice I created is called Dachjo. You can also hear a sample here. One interesting thing. When I added my created voice to the Tomtom world, I was able to choose Esperanto as one of the languages. Interesting, that. Ĉe la dua vojkruciĝo, iru maldekstren, poste stiru dekstren. Post kvindek jardoj, eniru la aŭtovojon. Poste, iru dekstren laŭ la trafikcirklo. Post kvincent jardoj, vi alvenis al via cel-loko. Kien ajn vi iras, jen vi estas. ‘Take the second left’ Ĉe la dua vojkruciĝo, iru maldekstren. ‘Take the second right’ Ĉe la dua vojkruciĝo, iru dekstren. ‘Take the third left’ Ĉe la tria vojkruciĝo, iru maldekstren. ‘Take the third right’ Ĉe la tria vojkruciĝo, iru dekstren. ‘ahead, Exit left’ Baldaŭ eliru maldekstren. ‘You have reached your destination’ Vi alvenis al via cel-loko. Kien ajn vi iras, jen vi estas! ‘Depart’ (only heard when you tap Test when selecting a voice) Ekiru. Per Esperanto vi povas veturi tra la tuta mondo. ‘Stay in the left lane’ Restu en la maldekstra koridoro. ‘Stay in the right lane’ Restu en la dekstra koridoro. ‘Take the motorway’ Eniru la aŭtovojon. ‘Leave the motorway’ Eliru la aŭtovojon. ‘Leave the motorway at the exit on the left’ Eliru la aŭtovojon per la maldekstra elirejo. ‘Leave the motorway at the exit on the right’ Eliru la aŭtovojon per la dekstra elirejo. ‘Go around the roundabout’ Iru laŭ la trafik-cirklo. ‘Cross the roundabout’ Iru trans la trafik-cirklon. ‘Go left on the roundabout’ Iru maldekstren laŭ la trafik-cirklo. ‘Go right on the roundabout’ Iru dekstren laŭ la trafik-cirklo. ‘Take the ferry’ Uzu la pramŝipon kaj ĝuu la mar-aeron. This entry was posted on May 17, 2011 at 8:12 pm and is filed under esperanto. You can follow any responses to this entry through the RSS 2.0 feed. You can leave a response, or trackback from your own site. Dankon! Mi devus provi ilin. Mi havas tomtom ilo kiu mi povas uzi kun Esperanto (Kvankam mi volus uzi kun Sygic-o en mia poshtelefono.